NEW YORK, March 13, 2017 /PRNewswire/ -- Voya Financial, Inc. (NYSE: VOYA), announced today that it has been named one of the 2017 World's Most Ethical Companies® by the Ethisphere Institute, a global leader in defining and advancing the standards of ethical business practices. This is the fourth consecutive year that Voya earned this honor. "At Voya Financial, our culture – and the authentic character of the Voya brand – is a reflection of our commitment to doing business the right way," said Voya Financial Chairman and CEO Rodney O. Martin, Jr. "We emphasize trust, transparency and continuous improvement – and we reward our people based on not only what is achieved, but how it is achieved. Our customers are increasingly seeking to do business with companies that are genuinely good – and we are proud to be recognized by the Ethisphere Institute as a 2017 World's Most Ethical Company®." The World's Most Ethical Company® designation honors those companies who recognize their role in society to influence and drive positive change, consider the impact of their actions on their employees, investors, customers and other key stakeholders and use their values and culture as an underpinning to the decisions they make every day. "Companies honored as the World's Most Ethical invest in their local communities, embrace strategies of diversity, inclusion and equality – and focus on the long-term as a sustainable business advantage," explained Ethisphere's Chief Executive Officer, Timothy Erblich. "In our analysis of 2017 World's Most Ethical Companies, Voya Financial scored well against our established criteria. Congratulations to everyone at Voya for being recognized as one of the 2017 World's Most Ethical Companies®." The World's Most Ethical Company assessment is based upon the Ethisphere Institute's Ethics Quotient® (EQ) framework which offers a quantitative way to assess a company's performance in an objective, consistent and standardized way. The information collected provides a comprehensive sampling of definitive criteria of core competencies, rather than all aspects of corporate governance, risk, sustainability, compliance and ethics. Scores are generated in five key categories: ethics and compliance program (35%), corporate citizenship and responsibility (20%), culture of ethics (20%), governance (15%) and leadership, innovation and reputation (10%) and provided to all companies who participate in the process. 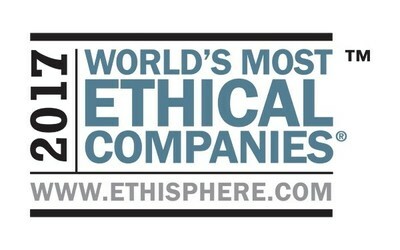 ­­The full list of the 2017 World's Most Ethical Companies® can be found at http://worldsmostethicalcompanies.ethisphere.com/honorees/. Voya Financial, Inc. (NYSE: VOYA), helps Americans plan, invest and protect their savings — to get ready to retire better. Serving the financial needs of approximately 13.6 million individual and institutional customers in the United States, Voya is a Fortune 500 company that had $11 billion in revenue in 2016. The company had $484 billion in total assets under management and administration as of Dec. 31, 2016. With a clear mission to make a secure financial future possible — one person, one family, one institution at a time — Voya's vision is to be America's Retirement Company®. Certified as a "Great Place to Work" by the Great Place to Work® Institute, Voya is equally committed to conducting business in a way that is socially, environmentally, economically and ethically responsible and has been recognized as one of the 2017 World's Most Ethical Companies® by the Ethisphere Institute, and as one of the Top Green Companies in the U.S., by Newsweek magazine. For more information, visit voya.com. Follow Voya Financial on Facebook and Twitter @Voya.